It can be hard to find healthy Halloween snacks to feed everyone on Halloween. The day is so full of fun and sugar, it is hard to entice someone with the food pyramid. 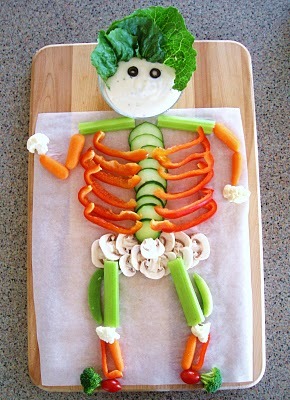 But Feeding Frenzey is helping to change that with this amazingly cute Skeleton veggie tray. And I am pretty sure the kids will have as much fun making it as eating it. For a few more healthy Halloween ideas, check out this cute Halloween lunch and fruit salad jack-o-lanterns. That veggie skeleton would NOT get eaten at my house. And that would be very good, Halloween-wise. It would start to rot and smell. Very ghoulish and gross. And after your post, I saw a link to pumpkin fudge! OMG! OK, I LOVE FUDGE, way too much. I am trying really hard NOT to go look...but I must...Have a great evening! I love this!!! Sometimes it's nice to see something other than chocolate for Halloween! Valerie, your family won't eat veggies at all? Even with a yummy dip? My daughter is the pickiest eater and the only veggies I can get her to eat without gagging are fresh veggies, so there are a LOT of them at our house. My kids would adore this! I am lucky my kiddos are a few of the ones that actually LIKE veggies! I saw this on Pinterest recently and wanted to thank you. This is the perfect edible skeleton cooking project for my preschool class. Can't wait!